To purchase multiple tickets register additional guests either under your own name or your guest's name. This ticket does not include complimentary food or beverage. Full event access including post concert entertainment and food. To buy multiple tickets, register additional guests under either your own name or the name of your guests. If you can't join us for the early part of the evening, come for the post concert party hosted by DJ Superfly. Register additional tickets as guest. The initial registration is the first ticket. Eg if you want 2 tickets register and add 1 guest registration. newchoir is rolling with the momentous legalization of recreational cannabis by hosting a smokin' event at Toronto's iconic Masonic Temple Concert Hall. 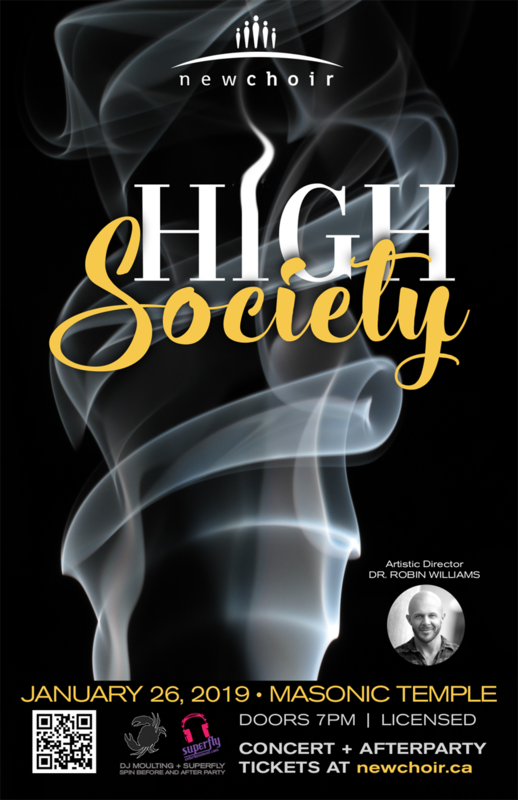 Our musical exploration of everything that puts the “high” in life –music, love, friends and, yes, some enhancements from nature too - will leave you flying! In addition to the newchoir performance, enjoy the pre-concert musical offerings of Electronic Music DJ Molting, food to satisfy your munchies and a post concert dance party hosted by DJ Superfly. Buzz around our silent auction of highly desirable goodies too. A full night of fun, hosted by newchoir, Toronto's rock and roll choir! A limited number of concert only tickets are also available. A tax receipt will be provided post-event for the maximum allowable amount.